A fourth-tier promotion party against Northampton on the final day of the season. Pompey fans will be hoping for a bout of royal blue-tinged Groundhog Day, following the release of the fixtures for next season. Immediately jumping out from the 46-game schedule is the final day visit of the Cobblers to Fratton Park. There are shades of that memorable last day of the 1979-80 campaign, for those who go back that far. Back then Frank Burrows’ side had to pick up a win at the County Ground and hope Peterborough or Walsall did their bit by beating Bradford or Newport County, respectively. 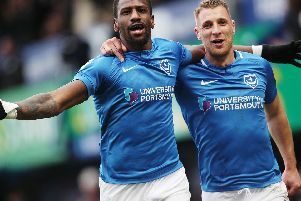 Peterborough obliged and Pompey were promoted in fourth place, thanks to a far-superior goal difference to the Bantams. What price similar drama on May 7, 2015? Yesterday’s fixtures announcement is traditionally one of the most exciting days of the closed season for fans. The anticipation of the 9am release and digesting the course the nine-month campaign will take always stirs excitement. Maybe the days of seeking out the trips to Manchester United, Arsenal and even a local derby are gone for now. But that doesn’t make plotting a route through what lies ahead a lesser event. Nowadays the eyes are well versed in quickly extrapolating the key info. Are we at home on the opening day? Are we at home on the final day? What’s the Christmas period look like? The fixture list makes pretty palatable reading to Paul Cook’s men and supporters alike. The first four home league games – Dagenham & Redbridge, Morecambe, Accrington Stanley and Barnet – offer the chance to harvest a decent return. But the first quartet of away fixtures – Plymouth, Crawley, Luton and Oxford – make for trickier tests. Christmas offers the traditional congested period, but one without significant distance to travel. The same can’t be said of back-to-back slogs to Morecambe and Accrington in January (unless the FA Cup is still keeping Pompey busy, or course). Those who collect grounds on their Pompey travels will have January 30 ringed in the calendar, as the Blues take their first visit to The Hive Stadium – home of Barnet. Now, it’s just the 51-day wait to negotiate until we can get going (and 324 days until the Northampton party...).